There is an urgent need in consumer electronics for infrared optoelectronics, including light emitting diodes and photodetectors. To date, however, infrared optoelectronics are served by costly CMOS incompatible III-V semiconductors. Recently, a new class of semiconductors based on colloidal quantum dots that addresses the CMOS compatibility issue has emerged. When it comes to consumer electronics, the use of RoHS compliant materials is a prerequisite, and therefore, there is a strong need for the development of high-performance devices based on environmentally friendly elements, something that has remained elusive. To address this challenge, ICFO researchers have discovered that by controlling defects in materials one can extend the semiconductor's spectral reach beyond its bandgap, expanding thereby the material availability for the infrared part of spectrum. In a recent study published in Advanced Optical Materials, ICFO researchers Dr. Nengjie Huo, Dr. Alberto Figueroba, Dr. Y. Yang, Dr. Sotirios Christodoulou, Dr. Alexandros Stavrinadis, led by ICREA Prof at ICFO Gerasimos Konstantatos, in collaboration with Prof. C. Magén from Univ. of Zaragoza, have reported on the development of an infrared detector using bismuth sulphide, which has fast high photo response levels in the short-wave infrared range thanks to the formation of defects in the material. 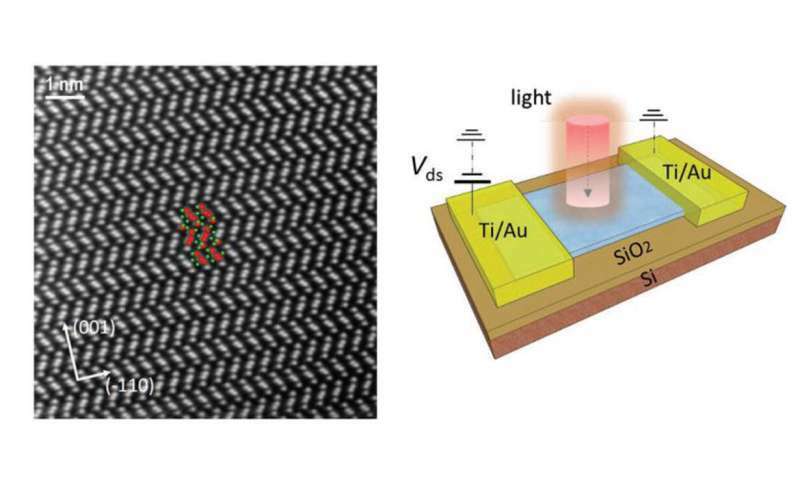 In their experiment, the researchers fabricated a photoconductive detector, depositing a very thin layer of Bi2S3 flakes onto a Si/SiO2 substrate. Once built, the team was able to observe that the Bi2S3 flakes possessed sulphur vacancies or defects in the material (sulphur-deficient), which created extended in-gap states, allowing an increased absorption of light below the bandgap value of Bi2S3, that is sub-bandgap. Such features led to a high-gain, low-noise and high-sensitivity photodetector. To understand the sulphur deficiency mechanism, they built a second photodetector and synthesized the Bi2S3 crystal, by performing a sulfurization process (changing the concentration percentages of Bi and S in the crystal) and subsequently refilling the sulphur vacancies. They observed that the photodetector had a much faster response time, but was limited to the spectral range in the near infrared. Thus, to improve the response time without sacrificing its spectral coverage into the infrared, they carried out a mild chemical treatment on the sulphur-deficient-based detector through a surface passivation process of the crystal. Completing the treatment, they observed that the time response had reached a value of approximately 10ms for the infrared and visible light range, 50 times faster than the original sulphur deficient-based detector.